While Jon and I were on Skye, Caroline Dear invited us to her studio, where her work revealed a profoundly impressive exploration of the potentials of heather, hair moss and other materials. 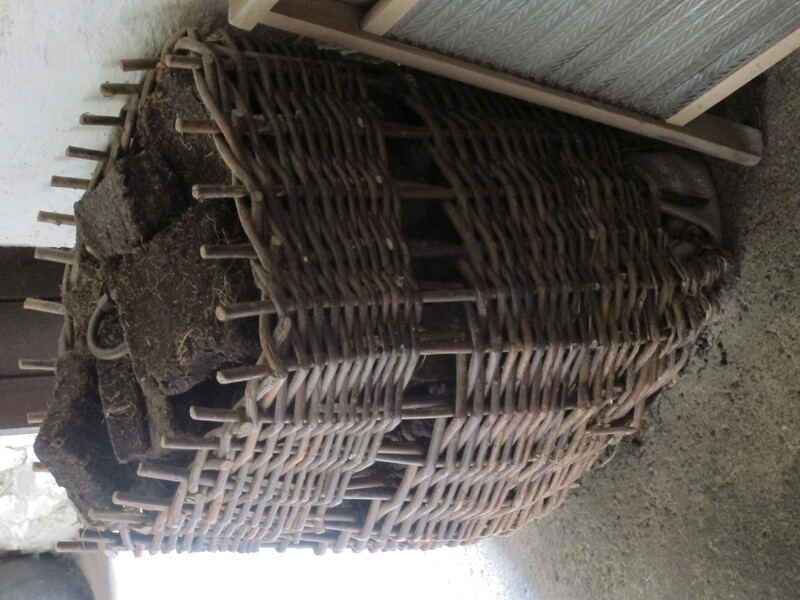 She also recounted several local stories, including one about two brothers from South Uist who used to travel to Uig in order to cut hazel for making creels, and another account of a Skye postman and his son who made frame baskets from willow over wire frames. It was always very valuable to discuss research with local basket-makers and textile artists. Watching basket-makers at work inspires local people to tell the practitioners of the use of basketry through personal family experiences and memories, as illustrated by Caroline’s account. It is ironic that while Skye is famous for its former basket factory at Kilmuir, which supplied much of Scotland with baskets for the herring industry, and that while there are many picturesque postcards of crofters working with mudags during spinning, or carrying creels when collecting peat or seaware, yet almost no baskets exist in public collections from this island. We discussed this with Caroline, and her view was that this could perhaps be attributed to Skye’s popularity as a tourist resort, even in the late 19th and early 20thcenturies, so that possibly tourists had bought them as souvenirs, or that Skye had come earlier than other western isles to the import of plastics and other consumer goods which became substitutes for baskets. 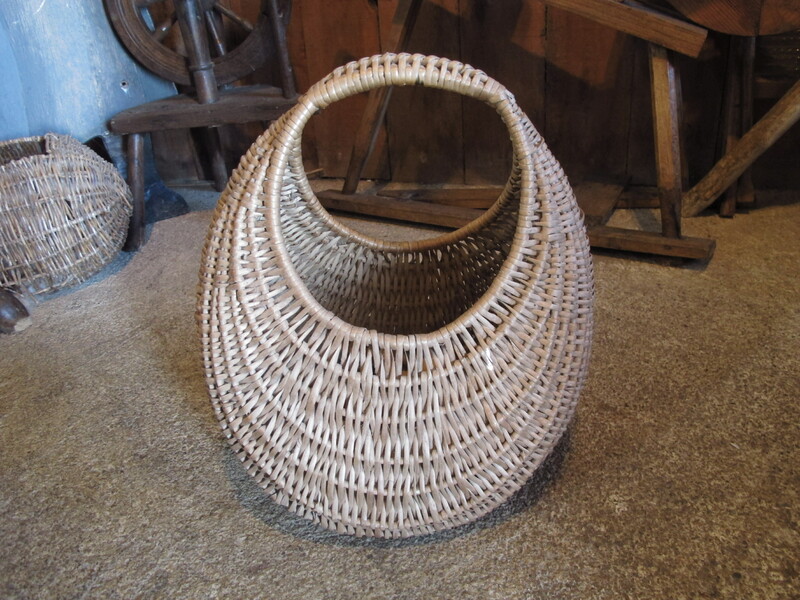 A further possibility might be that the perception of domestic and other manual work associated with baskets as shameful, as Isobel Grant described, also impacted earlier on people here, and may further account for Skye’s lack of existing basketry heritage. Our final day in Skye held a meeting with Mr Jonathan Macdonald, founder and custodian of the Skye Museum of Island Life, followed by a tour of the museum. During his life of more than 90 years, Mr Macdonald had worked for the Skye Osier Company, also known as the Kilmuir Basket Factory, which was set up in Skye through the Highland Home Industries Bureau in 1908-9, and closed in 1956. He had also set up the Skye craft shop, famous for its variety of crafts, before founding the museum in north Skye near Kilmuir in1965. 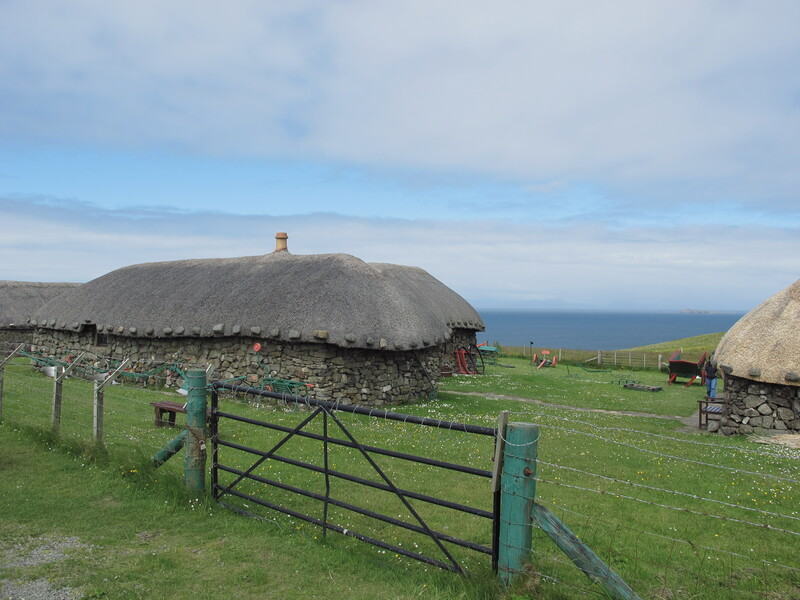 The museum consisted of several renovated thatched cottages, including a croft, a weaver’s cottage, a barn, an old smithy and a ceilidh house. Mr Macdonald kindly agreed to see us, despite the numbers of visitors daily passing through the museum. He talked of the willow sites established in Skye at Monkstadt, St Columba’s Loch and at Hungadder, both of which supplied the Company, and working for the company itself. A man had to make 18 quarter crans a day in order to make a realistic living, he said. All the artefacts in the Museum were illustrated with beautiful drawings and texts which detailed the practical uses associated with each object. There were examples of mudags for spinning fleece, a ciosan, a beautiful condition peat creel, heather ropes, and the Ose or Skye basket. 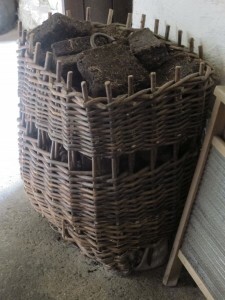 Through the work at the Kilmuir basket factory, this basket became associated with Skye in the 1950s. It was sometimes called a ‘hen basket’, reputedly first made to carry a broody hen, although its origins are much older than the Skye basket factory, and it is found on British illuminated manuscripts from the 12th century onwards.